Zaige Waste Management Holding Group (Aus) Ltd (ZGZ.ASX) has issued a Refresh Supplementary Prospectus which supplements the company’s Original Prospectus dated and lodged with ASIC on 14 November 2017. Both documents form the 'Disclosure Documents', and must be read together. To access, please click on the 'Access Disclosure Documents' button. As of the 23rd January 2018, the Company received applications for a total of 69,654,263 Offer Shares, totalling $13,930,852.60 - which is 99.5% of the total minimum subscription of $14 million. In relation to the Applications received to date, the Company notes that it has not achieved shareholder spread requirements under ASX listing rules. The Company is required to have at least 300 non-affiliated shareholders, of whom at least 225 are Australian residents, each having a parcel of shares that are not subject to voluntary escrow with a value of at least $2,000. The offer has now been extended to close on 28th February 2018. New applicants who would like to acquire the securities will need to complete an electronic application form which will be available via email after downloading the Disclosure Documents on this page. Applicants who do not wish to withdraw their Application do not need to take any action. All Applicants who have previously submitted an Application Form have one (1) month from the date of the Refresh Prospectus to withdraw their Application and be repaid all Application Monies (without interest). Zaige Waste Management Holding Group (Aus) Ltd (ZGZ.ASX) is seeking to raise up to $20 million through the issue of 100 million shares at an issue price of $0.20 per share under an Initial Public Offer and ASX listing. The minimum subscription under the Offer is $14 million. The Company owns, indirectly through its wholly owned subsidiaries, the Zaige Business, which has been operational since 2009 and is focused on and generates revenue from the recycling of Scrap Materials and the sale of the Finished Products. The Zaige Business is currently profitable, with an FY16 NPAT of $14 million. Currently, the materials processed and recycled by the Zaige Business are scrap steel and waste plastics (Scrap Materials). Once processed, the Scrap Materials are converted into crushed steel pellets, steel sheets, plastic chips, plastic granules and plastic industrial products (collectively, Finished Products). Once completed, the Finished Products are sold to various types of enterprises in China, including steel factories, trading companies, and private traders. The Company is also in the process of establishing a new segment of the Business which shall focus on the recycling of waste tyres (the Heibaojing Business). Following successful completion of the Offer, the Company will focus on advancing the establishment of the Heibaojing Business, which will involve the Company finalising the approvals required under applicable Chinese laws and regulations for the operation of the Heibaojing Business. Once such approvals are obtained, the Zaige Group will proceed to acquire the relevant equipment to process the waste tyres and will commence the construction of facilities for such operations in China. At the same time, the Company plans to upgrade existing machinery to improve capacity and efficiency of the scrap steel and waste plastics segments of the Business. Zaige has also entered into a Shareholders Agreement with Waste Audit & Consultancy Services Pty Ltd for the provision of waste management consulting services in China and establish a Research and Training program in Australia. The joint venture will be known as Waste Solutions Asia Pacific Pty Ltd. Through the joint venture, the Company intends to establish a research training program in collaboration with an Australian University that shall develop new and innovative technologies for the waste management and recycling industries in China. Zaige Waste Management Holding Group (Aus) Ltd (ZGZ.ASX) is seeking to raise up to $20 million through the issue of 100 million shares at an issue price of $0.20 per share. The minimum subscription under the Offer is $14 million. Based on the offer price of A$0.20 per share, the market capitalisation of the Company is expected to be A$70 million if the Minimum Subscription is achieved, and A$76 million if the Maximum Subscription is achieved. 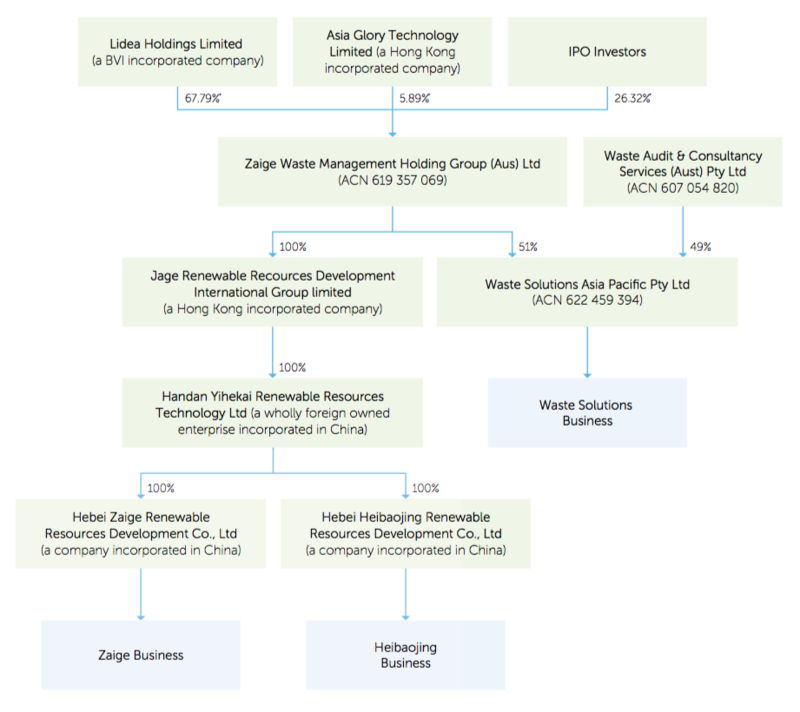 The issuer of the securities is Zaige Waste Management Holding Group (Aus) Ltd ACN 619 357 069. The offers of the securities are made in, or accompanied by, a copy of the disclosure documents which can be obtained by clicking on the "Access Disclosure Documents" button on this page. Anyone who wants to acquire the securities will need to complete an electronic application form which will be sent via email after downloading the Disclosure Documents. There are unique risks associated with an investment in the Company and the Shares offered under these Disclosure Documents are to be regarded as a speculative investment. Please refer to Section 6 of the Disclosure Documents (‘Risk Factors’) for the risk factors associated with the Offer. Potential investors should be aware that as the Zaige Group currently operates in China and intends to expand to Australia, following such expansion it will be subject to both Chinese and Australian laws and regulations relevant to the operation of the Business in these jurisdictions. It is the current intention of the Board to pay unfranked dividends in respect of full financial years for the Company ending on 31 December each year. The company intends to distribute a minimum of 10% of NPAT to shareholders by way of dividends in respect of each financial year, commencing for the financial year ending 31 December 2017. The maximum intended distribution of NPAT by way of dividends in a given financial year will be 20% of NPAT. The Company intends to commence payment of dividends to its Shareholders on an annual basis on or around March/April of each year commencing from 2018. ¹ Note: Lidea Holdings Limited will not be applying for any Offer Shares under these Disclosure Documents. 231,840,000 shares shall be escrowed for a period of 24 months from Admission. 11,200,000 shares shall be escrowed for a period of 24 months from Admission.